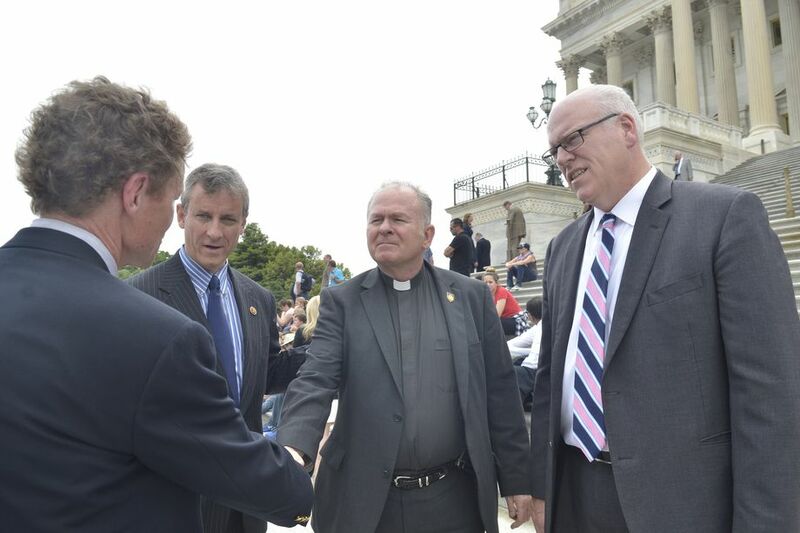 Lion Lamb Blog -- David Mundy: Is There a Chaplain in the House? but benefits balanced and shared by all Americans,"
There is a chaplain for the House of Representatives in the United States and some pundits ask why when there is supposedly a separation of church and state. The chaplain has always been a Christian leading others to challenge the chaplaincy on the grounds that the role should be ecumenical and multi-faith, if it continues to exist at all. The chaplain for the past few years has been a Jesuit priest, Father Pat Conroy (no, not the Prince of Tides author), and it sounds as though he was highly respected in his role. He invited a Muslim Imam to offer a prayer on one occasion, and when Congress was about to approve a massive tax reform bill he prayed that legislators be aware that some Americans might be left behind by what was transpiring. Enter Speaker of the House, Paul Ryan, a two-faced, self-serving piece of work if there ever was one. Even though Ryan is a Catholic himself, allegedly, he summarily fired Conroy as chaplain, although not to his face. It was an unprecedented move and likely motivated by the prayer which rather mildly held the Republicans to account. The tax bill was a trillion dollar gift to the wealthy and just about everyone knew it. Many Americans have a phobia about "getting something for nothing" socialism which might ensure that those lower on the economic scale get decent healthcare and education. The Republicans do love reverse socialism though, whereby the rich get richer through exemptions and tax breaks. Here's the good news. There was a lot of squawking about Father Conroy's dismissal, even though he didn't make a big deal about it. But after reconsideration and encouragement he wrote a letter rescinding his resignation and Weasel-of-the House Ryan has reinstated him. Injustice walked back, at least for the time being. Perhaps there shouldn't be a chaplain in the House, although it sounds as though they need someone there with a moral conscience to keep all the Christian-lite legislators in line.